There comes a young singer from Norway who has snowed in and is immediately successful in the German Schlager business with her mostly cheerful and unweighted songs. After a few years she suddenly disappeared from the picture again. Her name is Kirsti Sparboe. In Tromsoe, a town in the north of Norway also known as the 'Gateway to the Arctic', she was born on 7 December 1946. Life here doesn't offer much variety. Summer parties, dance evenings and family celebrations bring a few splashes of colour into the otherwise rather dreary monotony. Kirsti, who is already very musical as a child and loves to sing, uses these occasions for her first public appearances. After school, she completed a commercial apprenticeship, but continued to seize every opportunity to attract attention through her vocal talents. Since she now has an extensive repertoire of hits, folk songs and jazz and is well received by the audience, she soon receives her first fees. From time to time she is reported about in the local press and so she comes to her first broadcast in 1964. As a result she immediately gets a record contract and can record her first hits with Frankie Boy and No Og For Alltid in no time. Just eighteen years old, she represented her home country in 1965 with the song Karusell at the Grand Prix de la Chanson in Naples. Even two years later, when the Eurovisionsfestival takes place in Vienna, she is back again because she is now one of Norway's most popular singers. Norway is considered a country of fjords and bright summer nights, but as far as entertainment is concerned, the market is rather small and of little international importance. Arne Bendiksen is one of the most important people in the local music scene. He was a successful singer himself and is now making a name for himself as a producer and manager. He had contacts to the German Schlager industry and through his mediation Kirsti Sparboe received a contract with Telefunken in 1968. "This girl is extraordinarily talented and has what it takes to become the darling of the audience", they say and try to give her an optimal start on the German record market. First you delete her last name and then try to launch the singer with a few targeted PR actions in the press. This includes the gag with the polar bear that Kirsti expects on the tarmac when she arrives at Hamburg Airport. Of course, they're not real. It is Fritz Bauer, an employee of the record company, who has been put into a bear costume. For the debut single you choose the rhythmic Beatfox Du darfst nicht weinen, which comes from the Schlagerwerkstatt of the author team Henry Mayer and Georg Buschor. Kirsti is introduced to the German audience in May 1968 by Chris Howland in his programme 'Musik aus Studio B'. Success is not long in coming. The recording entered the charts at the beginning of June, was recorded there for 7 weeks and climbed to 24th place. Kirsti can be satisfied with this result. It's also the record company, especially since the next single sells well as well. Also in the GDR one becomes attentive to the lively Norwegian. With the song Two Eyes, written by Jürgen Hermann and quite sophisticated, which is released on Amiga, she gives her musical calling card there in the same year. 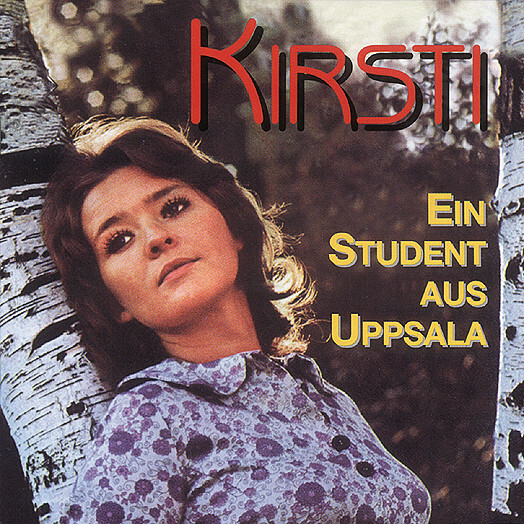 Kirsti had her greatest success in 1969 with the title A Student from Uppsala. The fresh and cheerful number with the catchy melody is tailor-made for her. With a whirlwind-like performance, it conquers every hit parade. For 12 weeks this catchy tune has been able to stay on the official sales charts and reaches 15th place as the highest quotation. In the 'Bravo Music Box' Kirsti advances to 11th place. She also presents the song on the ZDF hit parade. This programme played an important role in pop circles at that time and performances were hotly contested among the performers. At home she is at least as much in demand and in 1969 she starts for the third time for Norway at the Grand Prix, which will be held in Madrid this year. This time she sings a composition by Arne Bendiksen with the easily remembered title Oj, Oj, Oj. Although this lively song fails the international jurors - even from Germany there are no points for it - she scores another goal in Norway. In 1970 Kirsti was one of the 6 performers who competed in the German qualifier 'Ein Lied für Amsterdam' for participation in the European Schlager competition, which had become somewhat controversial in the meantime. On 16 February at 21.00 o'clock this transmission goes from the television studio of the hessian broadcast in Frankfurt over the screen. In addition to Kirsti, Katja Ebstein, Mary Roos, Roberto Blanco, Peter Beil and Reiner Schöne are participating in this competition. Kirsti is sent into the race with the title Pierre der Clochard, composed by Drafi Deutscher, but cannot qualify for the final round. Katja Ebstein takes the ticket to Amsterdam. She then rewards the expectations placed in her with a third place. Pierre der Clochard is released by Kirstis record company as a B-side. As an A-title she presents instead with Es ist alles gut a Mitklatschnummer nach alt bewährten Muster. Promptly she ends up in the ZDF hit parade again and also in the music publications the recording gets good marks: "This is Kirstis best record so far. The fast march beat lives from the chorus. It's all good what you do for love. With it the saucy Schlagergirl could land a hit again". But with this record she does not succeed in jumping into the bestseller lists. Kirsti is also supposed to take part in the 'German Schlager Competition' in 1970 and again she is unlucky. The song chosen for them is rejected by the ZDF, which co-organises and broadcasts the event. Kirsti isn't even particularly sad about that. She prefers to be at home in Norway with her daughters Christine and husband Benny Borg. He, too, is a well-known pop star in Scandinavia and - with the same company as Kirsti under contract - is also heading for a record career in Germany, but is unable to assert himself with us. Gradually Kirsti withdraws from the German music scene. She releases new singles at regular intervals, but in terms of sales she can't build on her previous success. Her fans in Norway, on the other hand, will remain loyal to her for years to come. There she continues to sing records, some of them in duet with Benny Borg, from whom she later separates. In recent years, she has developed into a recognized theatre actress and can convince audiences and the press above all in comedic roles. Customer evaluation for "Ein Student aus Uppsala"